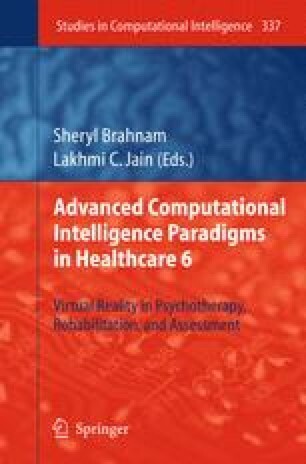 This chapter discusses the applications and solutions of emerging Virtual Reality (VR) and video games technologies in the healthcare sector, e.g. physical therapy for motor rehabilitation, exposure therapy for psychological phobias, and pain relief. Section 2 reviews state-of-the-art interactive devices used in current VR systems and high-end games such as sensor-based and camera-based tracking devices, data gloves, and haptic force feedback devices. Section 3 investigates recent advances and key concepts in games technology, including dynamic simulation, flow theory, adaptive games, and their possible implementation in serious games for healthcare. Various serious games are described in this section: some were designed and developed for specific healthcare purposes, e.g. BreakAway (2009)’s Free Dive, HopeLab (2006)’s Re-Mission, and Ma et al. (2007)’s VR game series, others were utilising off-the-shelf games such as Nintendo Wii sports for physiotherapy. A couple of experiments of using VR systems and games for stroke rehabilitation are highlighted in section 4 as examples to showcase the benefits and impacts of these technologies to conventional clinic practice. Finally, section 5 points some future directions of applying emerging games technologies in healthcare, such as augmented reality, Wii-mote motion control system, and even full body motion capture and controller free games technology demonstrated recently on E3 2009 which have great potentials to treat motor disorders, combat obesity, and other healthcare applications.